Google has been a touch busy this week refreshing its app for the Android Market, adding an 'auto-update apps' feature. This small but rather significant change means that in future any app that needs updating can be done automatically without having to go into every single individual app to tweak this setting. 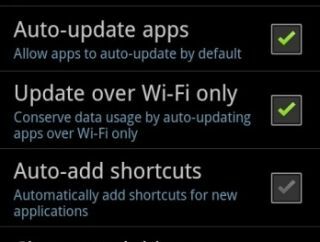 Another add-on is the ability to only update your apps when you have a Wi-Fi signal, which should alleviate any worries that auto updating will put you over any data usage limit you may have for your smartphone. Considering the first few versions of the Android Market for phones and tablets sucked harder than a Dyson tackling a golf ball it's nice to see Google giving more love to the app. Google hasn't had much luck with its apps recently, given that it had to pull its Gmail app for iOS, so let's hope this update fares a little better. The new Android Market update is version 3.3.11. Cherish it as it may well be the last time you actually have to manually update the service.